Worked in the studio again yesterday with some of my new "tools" and am so excited to have an entirely new catalog coming shortly. My dad used to say the right tool makes any job easy…and I'm just saying I need a few new "tools" to make the job of cardmaking easy. I think that's what he was saying, right? This was a layout that we did this past month at Layouts Class. 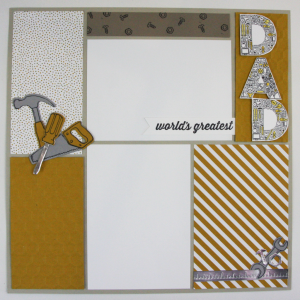 It is super cute and since Father's Day is coming up, I thought I'd get the scrappers ready for June. Of course, I wanted them to use the Nailed It and Urban District Stamp sets before they are gone on May 31t. Get your sets today! And then join us for Class on May 18th! See you!